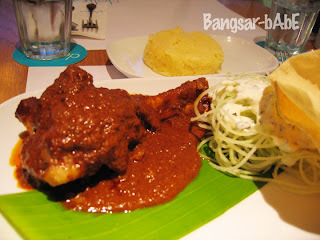 Had dinner with Jeen at Delicious, Bangsar Village 2. I ordered the Marsala Lamb Shank while she had the Waygu Beef Pie. The lamb was very tender…almost flaky and not overly spicy. Served with cucumber strips topped with sour yogurt dressing and crispy papadoms, it was quite a big portion. I didn’t feel like having rice so I changed it to mash potatoes. The well-infused spices and thick gravy managed to mask the musky, gamey smell of the lamb. 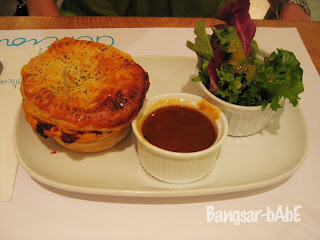 The Waygu Beef Pie arrived much much later as the waitress forgot to send the order to the kitchen. 0_0 Poor Jeen had to wait for quite some time. To make things worst, the pie was mediocre. Although the beef cubes were tender, it was too salty. The pastry was nice though…light and flaky. For dessert, we got a chocolate brownie to share. The brownie was disappointing. It wasn’t as rich as before and was quite hard (as in if-I-threw-it-at-you-it-can-knock-you-out-hard). 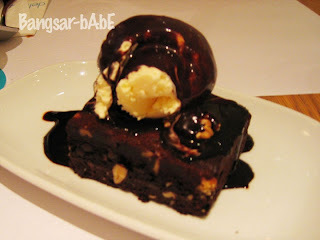 The chocolate sauce and vanilla ice cream did little to help soften the brownie. Verdict: The food was not as good as I remember it to be. Nevertheless, it’s still a nice place to hang out with friends. *love the glass walls they place smokers in. It’s as if they are on display…kekeke. sounds like the food is not good from what i am reading… are you sure its a good place to hang out then? there are many other places with good ambiance AND food..